Brussels, 21 October 2016. Education policy in Europe faces serious challenges. This was the conclusion of the 20th International Annual Conference, staged in Brussels by the European Association of Institutes for Vocational Training (EVBB) together with the European Vocational Training Association (EVTA). 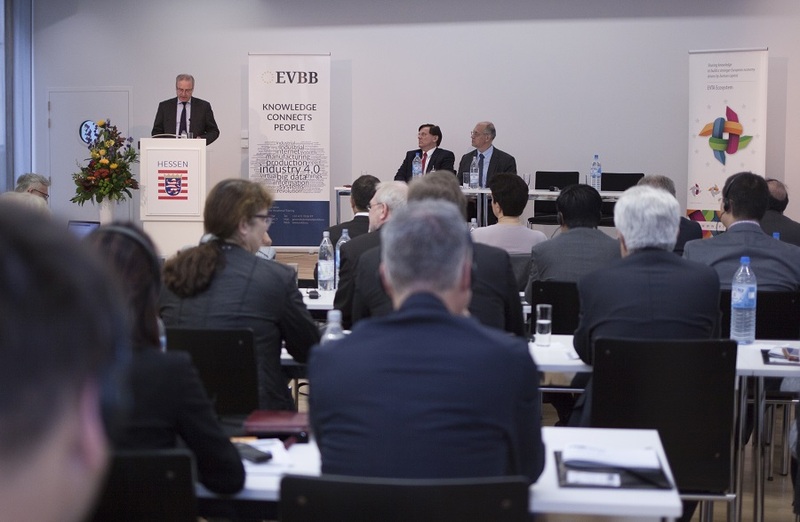 Over two days, around 100 attendees discussed the latest trends and developments in the Representation of the State of Hessen to the EU. The Director of the Representation, Friedrich von Heusinger, reminded delegates of the latest statistics on vocational training. These state that there currently around 70 million Europeans who can neither read nor write properly: “National solutions are not producing the desired results”, said von Heusinger. 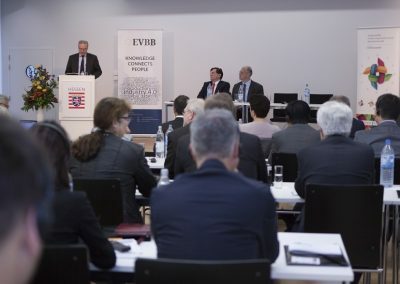 EVBB President Thiemo Fojkar and EVTA Executive Board consultant Yves Grange stressed that the joint conference held by the two organisations was only a first step. Thiemo Fojkar made it clear that the various associations involved in vocational training would have to extend their collaboration in the coming months. Everything must be done to integrate refugees into European employment structures. It would also be important to develop new strategies in their countries of origin, and to improve conditions on the ground there. In a video welcome message, EU Commissioner Marianne Thyssen left viewers in no doubt that vocational training can help integrate disadvantaged people. She also stressed that vocational training must be the first option that comes to mind for young people, though much remained to be done before this was the case. Austrian Member of the European Parliament, Josef Weidenholzer, addressed Eurosceptics by saying that Europe is not a threat, but a huge opportunity. Secretary-General of SOLIDAR, Conny Reuter struck a similar note in his keynote speech. The European ideal was mired in crisis, and many people now mistrusted politics in Brussels. Reuter felt strongly that Europe needs to regain that trust. 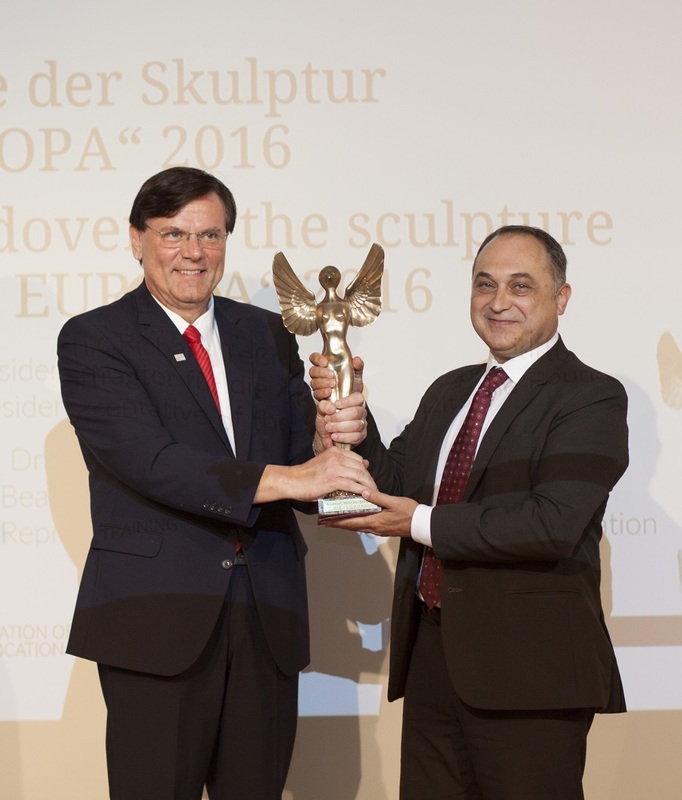 The first day of the conference traditionally comes to a close with the award of the “DIE EUROPA” prize. This year, the prize was awarded to “Ente Nazionale Acli Istruzione Professionale” (ENAIP) Switzerland. 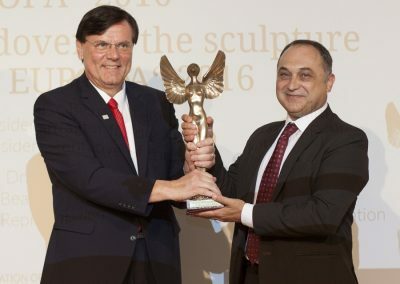 The prize is awarded by the Adalbert Kitsche Foundation. It is awarded annually to innovative vocational training projects which focus on disadvantaged young people. The “Europa” is a female winged statue cast in fine bronze. Its head is modelled on the head of a dove of peace, standing on the European part of a stylised globe. The EVBB is a European umbrella organisation. It was founded in December 1992, a few days before the launch of the European Single Market. Today, it has 55 member associations and members from more than 20 countries in Europe, Africa and Asia. The EVBB has more than 35,000 employees in total in its member associations, working in over 1,500 educational institutions. More information can be found at www.evbb.eu. The “European Vocational Training Association” (EVTA) is a network of European organisations, working together in the field of vocational training. Over the past 15 years, the EVTA has become a key player in this field. More information on EVTA can be found at www.evtaecosystem.eu.